I wish there was a way to know if this is the same loon that hung around the flowage last year. 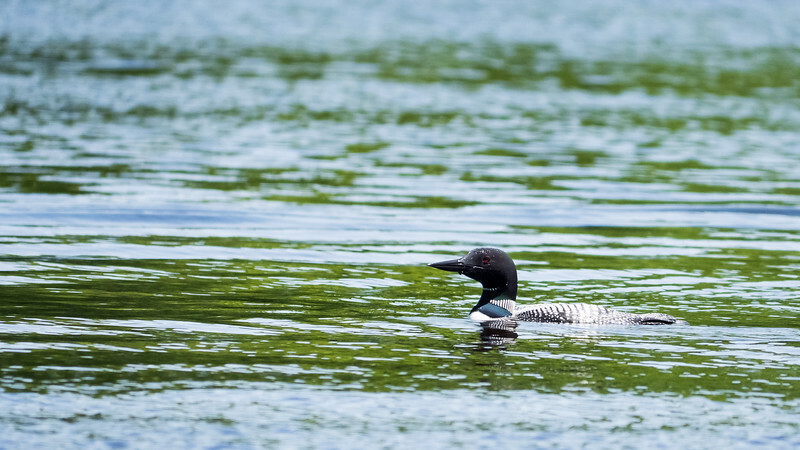 According to a book I read about loons, they often return to the same body of water they were born on, or one nearby. Pairs often nest in the same location for years. Because this particular section of the river doesn’t seem to be protected enough for loons to nest, I think the ones that stay here are non-breeding adults. This is a period of 1-3 years that occurs just after fledgling. These birds will often have to take bodies of water that don’t have an already established pair. The next flowage up river has a pair of loons nesting (it has a really large swath of small trees and bushes that they seem to like). I wonder if this adult, or the one from last year if they’re not the same, are offspring from prior seasons. No way to know, but just one of the eternal mysteries of the common loon. I think she must have laid her eggs nearby because I saw her quite a bit on the banks to either side of the dock. My husband and I had been sitting out on the far end of the dock for a while when she came from up river, keeping close to the edge where the trees and bushes provided cover for her brood. For a while she herded them around and over the low-hanging branches and they gobbled up anything they could reach; sometimes coming up off the surface in a big stretch, little wings flapping, catching a bug as it raced to escape up a twig. So cute you could hardly believe it. In this shot they’re a little older and a lot bigger, but still pretty cute. 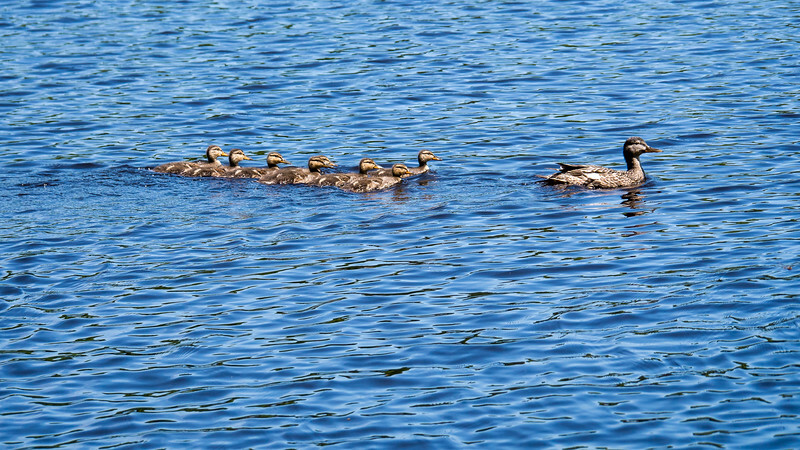 Mom was leading them around the dock to the down river side. When they’re smaller they don’t string out behind like this, but stay bunched up all around her, touching her if they could. Both pictures were taken from the dock using my 100-300mm zoom in shutter priority mode with auto ISO. They’re handheld and I find that keeping the shutter speeds above 1/2000s of a second works fairly well if I’ve got the battery grip attached. I’m getting a bit more adept with it, but damn I still need practice. It’s very hard for me to keep the bird in focus as it moves. I have many shots of the loon with the water in front of it perfectly crisp, but the bird itself hopelessly out of focus. There’s got to be a better way to do this. I just need to figure it out. How wonderful to have this in your own backyard! What a beautiful paradise. It’s such a blessing to view nature…..especially the little ones growing,as I have been doing the same thing here in my own yard (but mine are woodland animals). Enjoy!